It is recommended that each leg of the triangle be at least 4 feet long, but no longer than 9 feet. 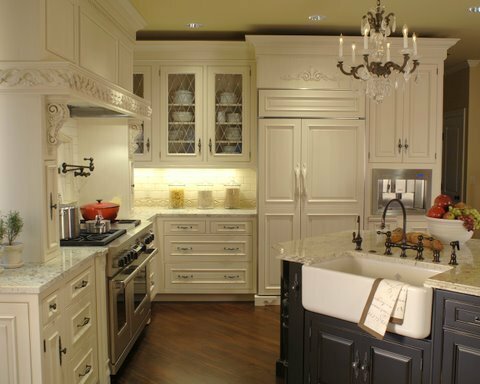 Cabinetry should not intersect any of the legs of the triangle by more than 12 inches, nor should major household traffic flow through the triangle. The idea is that kitchen comfort and efficiency depends upon a solid work triangle in which you can move easily between the three main work areas and in which other important functionality is also taken into consideration. Within the basic “triangle” structure – which can look very different in each individual space – there are a lot of design options that work well for overall kitchen appeal and practicality. In fact, there are no end of workable designs that keep the kitchen triangle intact while reflecting your own style and taste. In addition to considering the placement of your main work stations, it’s also important to take into account the location of other important features – workspaces, islands, etc – in order to assure good flow and functionality. This is where hiring a designer can really be a great investment. A professional will create and carefully build the project tailored to meet your desired goals. We’ll take your ideas and transform them into a kitchen that is both functional and beautiful. Click to view some of our kitchen designs. We design based upon years of experience with what works well, and have the flexibility to integrate your own style and design preferences into the overall scheme… so in the end, you get the kitchen you love to live and work in.